Just in time for performance reviews, the Society of Corporate Compliance & Ethics has published a comprehensive report on compliance officer pay, which estimates CCO compensation anywhere from $135,000 to $300,000, depending the size of your organization. The report doesn’t offer a single compensation number for the “average” chief compliance officer across all industries and years of experience. Instead, it provides a rich set of compensation data tied to specific types of organizations: compensation by years of experience, by annual revenue, by employees in the compliance function, by geographic region, and so forth. So if you want to peg your compensation relative to your employer’s peers with a high degree of specificity, and then stick it to the boss during that next conversation with the CFO, general counsel, or HR chief—this is your Thanksgiving reading. 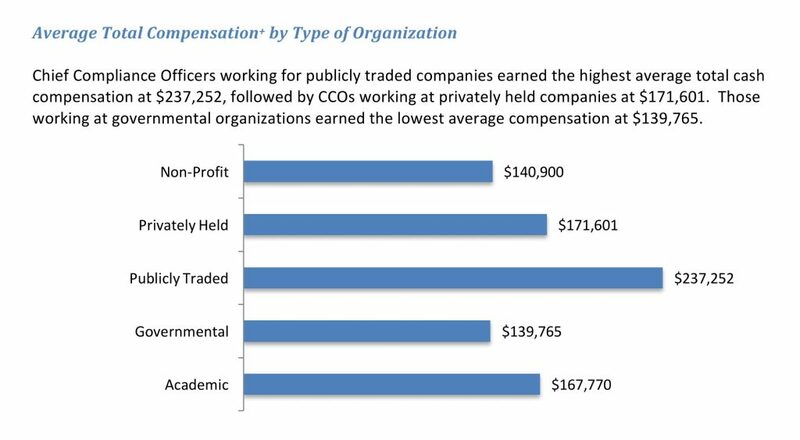 To no surprise, CCOs at publicly traded companies make the most compensation ($237,250), while those at nonprofits make the least ($140,090). The report also says that two-thirds of compliance officers are eligible for a bonus as part of their compensation, and one-third are eligible for bonuses equal to more than 20 percent of salary. 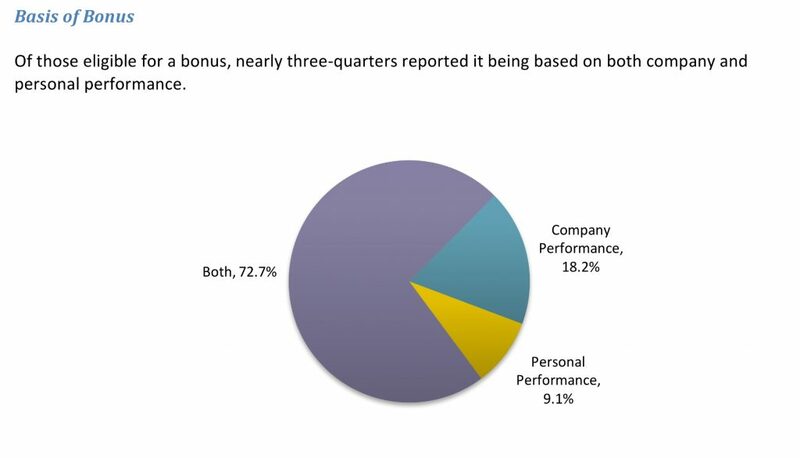 Of the group that say they are eligible for a bonus, more than 90 percent say at least some portion is determined by overall company performance. I’m a bit concerned about that second chart, since we just saw shareholder activists complain about incentive-based pay for the compliance officer in a governance spat with Cardinal Health. Any time we tie a compliance officer’s success to overall corporate profit or shareholder return, we’re introducing the risk that someone might put financial success over doing the right thing. Other statistics were not surprising either. For example, the more employees a CCO manages, the more money he or she makes. Average compensation for managing one person was $125,000; average for managing more than 20 was $300,000. Likewise, the more employees your organization has, the more revenue it has, the more years of experience you have—all of them correlate to higher compensation. 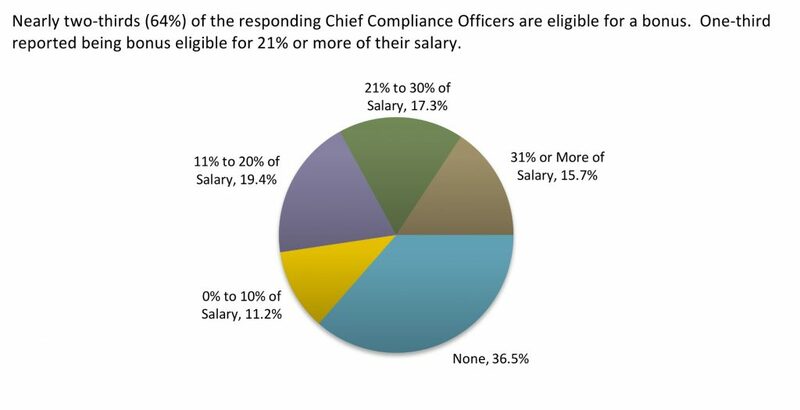 Compliance officers make the most in the West Coast (both salary and total compensation). They make the least in the East South Central region, which is Kentucky, Tennessee, Mississippi, and Alabama. One other intriguing statistic: compensation does not correlate to the number of risk areas you help to oversee. Remember that the next time someone voices another risk to worry about and asks compliance to put it on your plate. The true value of this report, however, is in the exhaustive data tables provided in the second half of the document. SCCE sorts responses by percentile, That will let you piece together what your peers make with exacting specificity. For example, a CCO living in New England, managing 11 to 20 employees, at a company of 15,000 to 30,000 people, with an annual budget of $2 million, in the manufacturing sector, who has the CCEP professional certification—the median compensation for that person is about $200,000. But a CCO of that description in the 75th percentile of his peers makes $268,400. And really, audit committee, don’t we want the best compliance function? Shouldn’t we strive to retain the best, which is me, by offering the best, in that 75th percentile range? That’s the argument to make. Anyway, dive into the report. If you see anything else interesting that I missed here, by all means let me know and we can explore in a post next week.